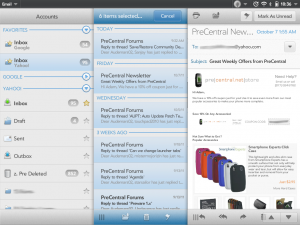 With the total Enyo-overhaul of the Email app on the TouchPad and webOS 3.0, one functionality that was greatly improved was the ability to move emails between folders. On webOS phones, you were required to use a meta-tap shortcut or select the "Move to Folder..." option from the Application drop-down menu. In webOS 3.0, you now have a dedicated onscreen move message icon ( ) on the top-left of the email message that you can press to bring up a list of folders to move the email to. In addition, you also have the ability to move multiple emails to a folder. Just follow the same steps as deleting multiple emails by tapping the little folder icon ( ) on the bottom-right of the middle pane of the email app, tapping on each email you want to move (sadly, no "select all" option is available) and then tapping the move message icon on the bottom of the pane. A pop-up will allow you to select the folder that you want to move the messages to. 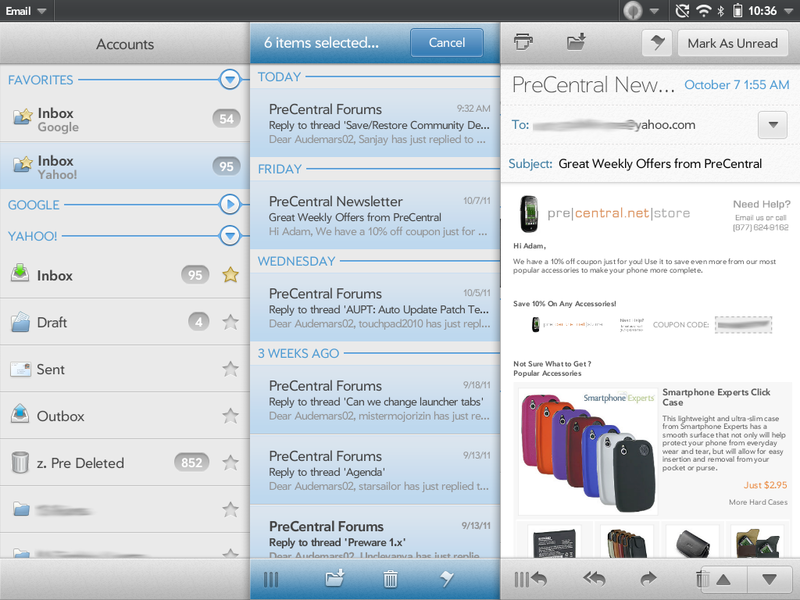 Just as in earlier versions of webOS, you can't create folders from within the Email App itself. You will need to do that from a desktop computer, or if you mail program has a website you can do this for from within the web browser.